EAST RUTHERFORD (WABC) -- New York Giants Pro Bowl wide receiver Odell Beckham, Jr., will not play against the Minnesota Vikings Sunday after the NFL upheld his one-game suspension for conduct during the team's 38-35 loss to the Carolina Panthers last weekend. Beckham was at NFL headquarters in Manhattan Wednesday, arguing his appeal to former Washington and Philadelphia wide receiver James Thrash. He posted on Twitter after the decision was released. Beckham drew three personal foul penalties in what the league called "multiple violations of safety-related playing rules." The Giants (6-8) face a key game on Sunday night at Minnesota. 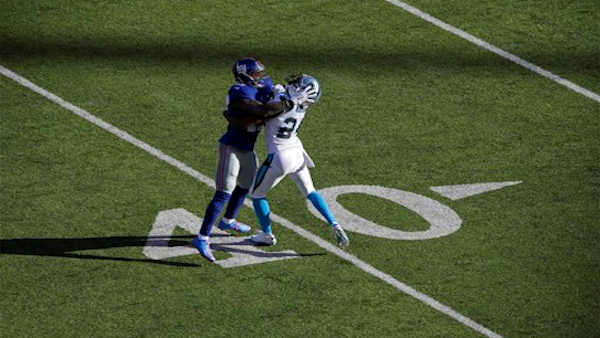 Beckham and Panthers cornerback Josh Norman tangled from the beginning of the game. There was plenty of pushing, shoving, swinging, wrestling, late hits and trash talking between them. The most flagrant action came in the third quarter when Beckham delivered a diving helmet-to-helmet hit on Norman while blocking. Beckham, the 2014 Offensive Rookie of the Year, has 91 catches for 1,396 yards and 13 touchdowns, tied for the league lead. He has a base salary of $893,000 and would have lost $55,813 for being suspended for Sunday night's game. The suspension was imposed by NFL Vice President of Football Operations Merton Hanks, who ruled that Beckham's actions placed his opponents at unnecessary risk of injury and should have been avoided. Meanwhile, the NFL fined Norman $26,044 for his role. Norman was fined twice Wednesday in the amounts of $17,363 and $8,681. He did not face suspension. Norman was docked the larger amount for striking Beckham in the head and neck area. The other fine was for a face-mask infraction. Both players were voted to the Pro Bowl on Tuesday.